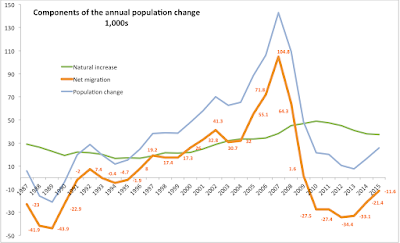 Irish migration and population data for the 12 months through April 2015 have been published by CSO recently. It is a tough read. There were 67,000 births in 2015, down on 67,700 in 2014 - a decline of 700. Compared to peak births year - 2010 - births are down 10,200. There were also 29,600 deaths in 2015, compared to 29,800 in 2014 which is 3,200 lower than peak year (1990), but more significantly - below 2013 and 2014 readings. Which means that natural increase in population was 37,400 in 2015, compared to 37,900 in 2014. This is the lowest natural rate of population increase since 2006 and it is driven exclusively by decline in birth rate which fell to 1.445% (births as percentage of total population) from 1.469% in 2014. Current birth rate is the lowest since 2001. Immigration into Ireland amounted to 69,300 in 2015, an uplift on 60,300 in 2014 and the highest reading since 2009. Immigration has been increasing every year starting with 2013. Note: I will be blogging on quality of immigration and emigration separately, so stay tuned. Current rate of immigration is ahead of 2008-2014 average (64,500) but behind 2000-2007 average (80,100). Meanwhile, emigration slipped slightly - the good news you heard by now, most likely - from 81,900 in 2014 to 80,900 in 2015. This brings 2015 emigration closer to 2011 level (80,600) and lowest in 4 years. 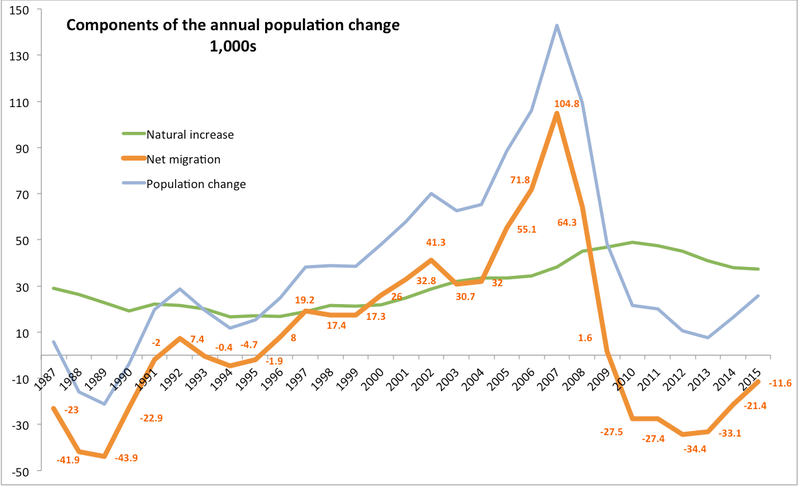 However, historical comparisons are still weak: in 2000-2007 average rate of emigration from Ireland was 30,700 and in 2008-2014 period it was 75,571, which means 2015 figure is higher than either pre-crisis average (obvious, really) and crisis period average. Net emigration stood at 11,600 in 2015, down from 21,400 in 2014 - a decline that is accounted for by an 8,700 increase in immigration and by 1,000 decrease in emigration. Thanks to immigrants numbers rising, we are at the lowest crisis period level of net emigration. Over 2009-2015, cumulated net outflows of people from Ireland stand at 153,800 - or 3.3% of our population in 2015 - close to 4 last years of combined natural increases in population (births less deaths). Over the last 6 years, average annual net emigration from Ireland stood at 25,900. During the 6 years of 1987-1992 the average was 21,050. even with 2015 decline in net emigration rate, we are still sending more people abroad in the current crisis than in the late-1980s -early 1990s crisis. Which brings us to the 'opportunity cost' of this emigration, or in simple terms - what would our population be were it not for the crisis. First up, our current population estimates: per CSO, in April 2015 there were 4,635,400 people living in Ireland - an increase of 25,800 on same period 2014. The rate of increase was the highest since 2009. Which is all good news. However, the rate of annual population increase in 2015 was lower than 2008-2014 average (33,386) and was way below the 2000-2007 average of 80,100. 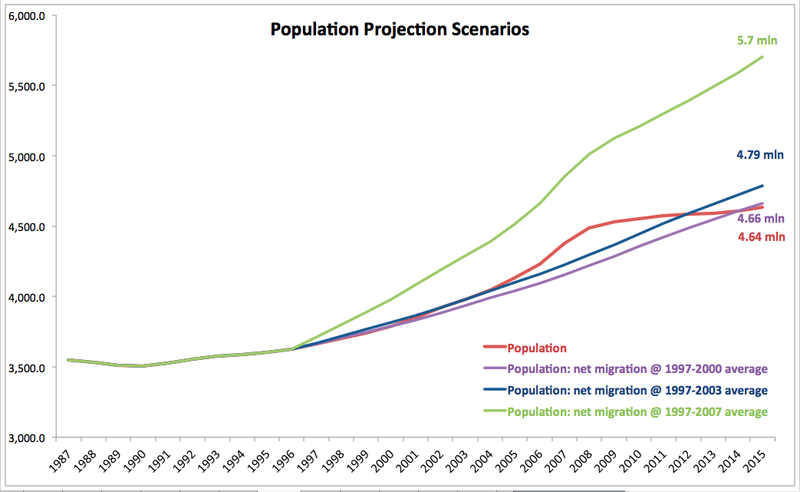 Scenario 1: take an average for net migration over 1997-2000 (capturing the period all of can agree was pre-bubble in the property markets) and take projection from 1987 through 2015 at this average net immigration rate and accounting for actual realised natural rate of population change. You get 2015 population at 4,662,700 or 27,300 more people than current official estimated population. Scenario 2: take an average for net migration over 1997-2003 (7 years period), capturing the period that some think was still pretty much pre-Garfield craze and, crucially, before the Accession of 2004 that brought into Ireland significant inflows of Eastern European workers. You get 2015 population of 4,784,500 or 149,100 more people than current official estimated population. Scenario 3: while a bit outlandish, let's just consider the period of the entire Celtic Garfield and take the average net immigration rate at 1997-2007. Extreme, I know, but what the hell. You get 2015 population of 5,701,300 or 1,065,900 more people than current official estimated population. 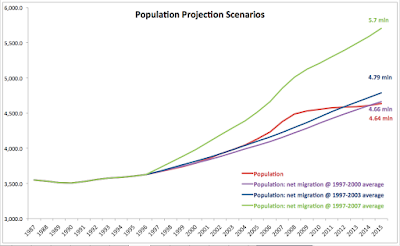 Stay tuned for more analysis of net migration flows.